Something amazing happened on CNN last night. Palestinians were portrayed as human beings. In his show “Parts Unknown,” Anthony Bourdain travels to exotic and controversial locales to examine the intersection of food, politics, and everyday life. Last night, he visited Jerusalem, the West Bank, and Gaza. Now if they could only say the same thing about the land, the houses, and the air, we might be able to get somewhere. In 2003, Israel began construction on a wall along the green line representing the Israeli-Palestinian border. The wall now stretches 450 miles. When completed, it will span 700 miles, 85% of it in Palestinian territory… Since 1967, 500,000 Israeli settlers have moved into the West Bank, all in contravention of international law, many in contravention of Israeli law, though in effect it seems to make little difference, they’re here and in ever larger numbers. Anthony, you will be hearing from certain individuals and organizations in the coming days. They will be upset. They’ve been trying to keep this stuff a secret. Bourdain finally made it to the settlement of Eli. Eli is located north of Ramallah and in the heart of the West Bank. It is nowhere near the 1967 borders. He asked its chief executive, Amiad, what Palestinians might think of its existence. He told Bourdain, “Actually they are happy we are here. We gave them prosperity for the past 45 years.” I was worried the show might go in a bad direction, but then Bourdain said, “I’m guessing a lot of people would disagree with that statement.” Wow, I think he’s getting it. Then Bourdain said, “So, from the high ground, you can see anyone walking at night, you can see pretty far out.” Wow, he is getting it! Bourdain then made a quick visit with a now famous group of Palestinian female drivers called “The Speed Sisters.” Now this visit had nothing to do with food, but he was able to be in a car alone with Betty Saadeh, a hot Palestinian woman. And you don’t turn down an opportunity like that. He even looked like he caught a little case of Palestinian fever. I can relate. It’s right there for all to see. And it feels like something out of a science fiction film. This is the wall. From the other side, from inside this place, it doesn’t feel like anything other than what it is. A prison. The honest portrayal of the residents of the camp, from their squalor to their own struggle to find productive channels of resistance, was something I had never seen on American TV. Bourdain noted that these Palestinian children do not have the luxury of idolizing pop stars and athletes. They turn to politics early, sometimes idolizing martyrs and politicians. And he’s right, there’s something wrong with that. We Palestinians are normal in so many ways. And we’re so not normal in so many others. Getting in and out of Gaza from Israel is truly one of the most surreal travel experiences you could have on Earth. Over 1.5 million people live in Gaza, most of them considered refugees, meaning they are not from the place they are compelled to live now. In most cases, they are either prohibited from or unable to leave. Israel decides who comes and goes, what gets in and what stays out. In Gaza, he met Laila Haddad, a well-known Palestinian author and activist who has written books about Gaza life and cuisine. As she explained that Gaza’s cuisine should include a lot of seafood, she noted that fishermen can rarely get prize catches as the Israeli military limits how far out they can sail. If they go too far, the Israeli navy shoots at their boats and cuts their nets. Bourdain and Haddad then visited the Sultan family, where they were served a Palestinian staple, maqloobeh. That dish happens to be one of my specialties (Yes, ladies, I can cook.) As they were eating, the man of the house was worried about being rude. Why? The cameramen were not eating. His wife asked Bourdain to open a restaurant for her. We Palestinians are always looking for a hook-up. We need it. Her husband continued to yell, but Leila assured Anthony. “This is a normal tone of voice. He’s not upset, by the way. This is how we talk. We yell.” I can relate. Many of these guys are not too sympathetic to my country, or my ethnicity I’m guessing. But, there’s that hospitality thing. Anywhere you go in the Muslim world, it seems, no matter what, you feed your guests, you do your best to make them feel at home. It’s true. We Palestinians are overly hospitable when people visit our homeland. Sometimes too much. 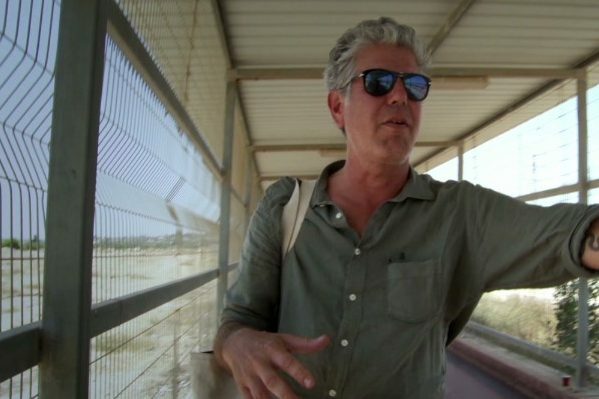 The episode ended with Natan, the owner of a restaurant right outside of Gaza in Israel. Natan’s daughter was killed by a mortar bomb in the constant struggle between groups in Gaza and Israel. Since 2008, over 1,600 Palestinians in Gaza have also been killed in this conflict. Natan spoke of the senseless deaths on both sides. He clearly disliked settlements, and he believed it was possible for like-minded people from both sides to get together and make peace. I would agree, if just more people like Natan existed. But the people who are pointing the guns at me aren’t named Natan… They’re named Netanyahu. By the end, Bourdain did not seem too optimistic about the prospects of peace. “One doesn’t even have to speak metaphorically because there is an actual wall… or a fence, depending on who you’re talking to.” Natan told him, “No. It is a big wall. It is ugly. It is really ugly. You can see it, it’s not far away from here.” Unfortunately, it’s not far away from anywhere. Part of being Palestinian in America is getting really excited whenever someone tells the truth about us on American TV. Kind of depressing, right? By the end of this hour, I’ll be seen by many as a terrorist sympathizer, a Zionist tool, a self-hating Jew, an apologist for American imperialism, an Orientalist, socialist, a fascist, CIA agent, and worse. I didn’t see any of that. I just saw what happens to anyone who actually interacts with Palestinians. You fell in love with us, and we fell in love with you. Why was there a need for a wall to be built? Why aren’t there any more suicide bombings in Israel these days? Suicide bombers were a minority of Palestinian zealots , with whom most Palestinians disagree. The wall was built not only to punish the Palestinians , but also to force them to leave their homeland. Of course, after Hamas won parliamentary elections in 2006, Israel arrested most of the members of parliament who were associated with the party, leaving them isolated in Gaza with very little to lose and no reason anymore to respond to Palestinian public opinion. As for why Israel actually built the Wall? Well, the route should make it pretty clear. It annexes not only prime land (much of it adjacent to strategic settlements) but also many of the West Bank’s most important water resources. Awesome! What a wonderful piece! I’ve never stepped into Palestine but reading your article gave me a virtual tour. One Day…One day I would love to smell the air I came from..step on the land I am from..and hug the uncle I have never known..I feel for you my country..to wake everyday and see a wall that traps you and soldiers who just want to hold a weapon for power and thrill to see others terrified ..so sad..so inhuman and yet others look at us and think we are the terrorists ..stay strong stay humble my Palestine! The question really is why are there suicide bombings in Israel? Whats the root cause? When did it start and why? Wall seems to hide the issue. hi joey, the root cause is continued Israeli colonization/expansion. plus, it doesn’t help that israel kills palestinians with regularity, that’s just something that doesn’t get as much attention in the western press. but you can read about it everyday, like today there’s another report about israel invading a refugee camp(jenin), blowing up the door to someone’s house, shooting a 19 year old ‘suspect terrorist’ dragging him outside, then he’s dead. they kill kids all the time. it’s an occupation so it’s excused as israel’s ‘self defense’. 60 years of no rights, collective punishment, and you ask why? use your noggin. JoeShmoe, it’s ok to build a wall, but build it on your own land! Here in America, if I want to build a stone wall between myself and my neighbors, I would do it in my own backyard, not cut down my neighbors olive trees and built it there! The wall has taken about 17% of Palestinian land in the West Bank. This is NOT including the land that was taken to build the illegal settlements. In my fathers village alone, turmusaya, over 8000 dhunums of farm land have been confiscated and stolen by the Shilo settlement between 2001-2012. This is farmland that the families in turmusaya own and have the deeds to predating the British mandate, including my grandfathers land. It was a terrific episode, by the way, and this is a great write-up. It is kinda like Christmas when I was a kid — giddy and exciting and surreal — when someone on American TV actually gets something halfway right about Palestine. Which is sad… But good on Anthony Bourdain for telling it like he saw it. And yes, I’m sure he will be hearing from certain people and organizations very soon… Godspeed, Mr. Bourdain. I have yet to watch the episode but I just returned from a visit to Palestine. It was a great trip. There are a lot of people struggling everyday but even though we were welcomed everywhere we went from the restaurant owner that we had breakfast at in Nablus, the 95 year old man that walked us around Nablus, the lady that gave us a tour of the brewery in Teybeh, the man that served us tea at the Kufiyeh factory in Al Kalil (Hebron), the people at the Freedom Theater in Jennin. These are all people that keep going through it all and that in itself is resistance. On a side note one of the best books I have read so far about Palestine is Fast Times in Palestine by Pamela Olson. Thanks Pamela for writing such a great book. Suicide killers are not the cause of this tragedy. It is the homicide killers of the occupation military that are the cause; they kill with impunity, go home and come back day after day to kill again. There would have been no young people, the indigenous Semitic Palestinians, using their bodies as weapons ( Palestinian have no army to fight back with) to resist the Israeli occupation if there had been no occupation, land theft and ethnic cleansing to their land. Israel has already lost the PR war; too many people know about it’s crimes. Unless Jewish leaders worldwide speak out loudly and clearly about these crimes, Judaism will be forever tainted by it’s support for a state that commits war crimes. In any case, the indigenous Palestinians are now using non-violent means, such as BDS and demonstrations with internationals, to get their message across. It is a Sisyphean task as the brutes in the occupying military do not respond to non violence with non violence- witness the murder of Rachel Corrie and the too many to name all indigenous Palestinians killed when they use non-violence. Excellent article. Anthony Bourdain we love you. Please go to this link and show your support for Anthony. Israel’s brutality and instigating sect fighting among the different Muslims has proven to be the worst of the troubles in the Middle East. The only way to stop them is to cut off all supplies to these Zionists to treat Palestinians as human beings. brilliant piece… Amer will you marry me? Glad a high profile white American is showing the truth but calm down. Do you show this much fawning over the many activists who have spent years and years showing support for this cause? Black folks? Latino organizers who connected the Zapatistas struggle with that of Palestinians? Give praise where praise is due, but it’s interesting that people get even more excited when it’s a white male showing solidarity. A great piece by Bourdain. If you want to see more of the real Palestine on American TV then start watching Al Jazeera America. You’ll see more there, more often, than any other outlet in the US. Come on, guys! He did a good job but I get really cynical when an American/Jew/Israeli or any famous person says one nice word about Palestine and all of a sudden they’re heroes. We should stop acting so desperate. And please don’t overlook the fact that he did a pretty terrible job (politically) featuring Lebanon after the 2006 war that he was trapped in- with not ONE single bad word about Israel, he only criticised Lebanon. He was also a total apologist on the Larry King Show. He should have just focussed on the food because the Lebanon episode was amazing in this respect. There’s a great documentary – “5 Broken Cameras” – about the experiences of Palestinian villagers protesting the wall. It was nominated for an Oscar last year and is currently available for viewing on PBS’s POV (through Sept. 25th). The whole “fever” thing? It evokes a long history of racist and sexist discourse about non-white women (for example, check out this critique of “yellow fever” – http://jezebel.com/video-series-on-yellow-fever-confirms-it-is-gross-and-474837540). So does characterizing Saadeh as a women who’s worth spending time with because she’s hot. That kind of rhetoric is really limited in its potential to empower Palestinian women. I think the ‘solution’ of giving back land from 1948 to descendants is about as ridiculous as giving the US back to Indians. But there needs to be a change of attitude on both sides. My husband has proposed building up more land from the sea and making a nation anyone can claim among Jews or Palestinians. I am sure there are other better ideas than blatant racism on both sides. Is this real . . . or another attempt at humor that is not funny? We should be ashamed of ourselves by not reporting accurately both sides. The media is too wrapped up in ratings to report the truth unbiasedly. Yet, we call ourselves a “free nation” I have visited Palestine and Israel to be greatly saddened by the treatment of the Palestine people by the Jews AND the US for not showing what it is really like to be on the “other” side. The Wall was built to serve a dual purpose: 1. As an instrument for a major land grab, and 2. As an instrument to keep people apart, i.e. apartheid. No one knows this better than the Israelis themselves. Don’t you just love it when your favorite TV personalities really do turn out to be decent human beings, too? Good for you, Tony! Palestinians are as human as any other race and most of them as good human beings as any of us but for the fact that they suffer from one of the worst plagues afflicting humanity namely Mohammedanism which converts one into a special class of humans that follow and imitate the path set by one of the worst criminals in human history.the more a human suffers from Mohammedanism more dangerous he becomes for rest of us.the proof of the pudding is in eating it so before you take an umbrage, go as a non muslim to a muslim majority country and try living there for sometime, if you can’t do that then get in touch with a hindu or a christian or a sikh in lets say Pakistan. Sixty years back they decided to stayback and not migrate to india and were almost 25 to 30 percent of the population but today ate less than 2 percent.thats like a community of 20 million people reduced to less than 500000 in 60 years!or try finding a persian/parsi/zoroastrian in iran. Or talk to a migrant worker in saudi arabia or a coptic christian in egypt or a kurd in turkey or iraq, simply anywhere that is Mohammed an majority. Paleetinians come across as such tortured souls because israel has taken the war to them instead of being foolish enough to let history repeat itself.as long as Palestinians remain Mohammedans thats closest to peace you have got and israelis need to be applauded for that. Ali Sina would know. Just search for him. Are you stuck in the Dark Ages? “Mohammedanism”? Read a book, please. There are so many that will enlighten you! Start with The General’s Son, by Miko Peled. Wonderful article. Thank you for sharing! Thank you Amer, you wrote our thought. Aaaaaaand here we go. The comments are all political. The issue is in how humans are treating other humans. Don’t give me rhetoric, commentators. Rhetoric won’t fix what’s going on. Apologies for the late comment. I watched that episode twice. I have a lot of respect for Anthony Bourdain from other excursions he made in other parts of the world. Watching the Palestine episode was sobering. I know all the places he visited far too well. The wall sits about 200 yards from my home – I grew up in Baka El-Gharbiyyah which is just on the inside of what is Known as Israel (the Palestine of 1948). Thanks Amer for sharing your thoughts.